This year’s Championships proved to be probably the best yet as the Resorts World staff allowed all of the players to get on with what they were there to do and that was to play the game and enjoy the day. Game One began on time and there were some big shocks early on as defending Champions Pokermasters UK, with all 5 of last year’s conquering players returning, scored zero points to leave their chances of becoming the first team to ever make a successful defence of the Title hanging by a thread. Blue Blood Poker made a great start though. 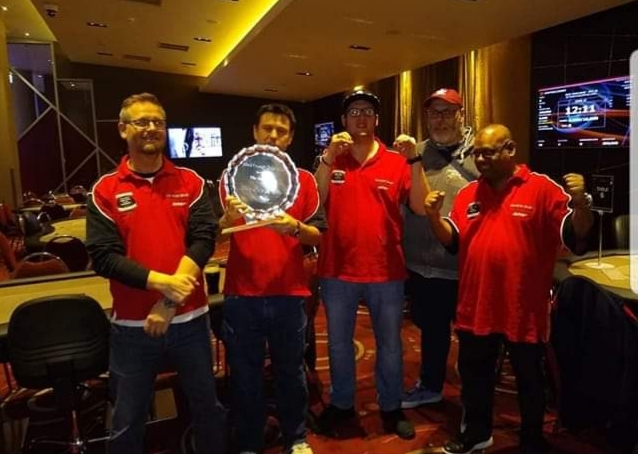 Famous for having 5 players sitting down and playing a cash game before the end of Level One in the 2017 event, this time Captain Liam Pickering and Mark England led the way with victories while Tony Griffiths and Jason Glenister were both 2nd as they scored 36 points, giving them a commanding lead over the BCPC “A” on 23, for whom Tod Wood was also playing the Captain’s roll by winning his table. Newcomers Fighting Mongoose were sat on 22 pts with Essex Home Game looming ominously in 4th on 20. Charles Mason was the only other BCPC player to notch a win in Round One but in Round Two, 7 BCPC members hit the 10-point mark, with “The Legend” Tod Wood being the only player on 20 points after he made it 2-for-2 as the BCPC “A” stormed into the lead after Hitendra Patel’s win pushed them onto 47 points. Blue Blood collapsed, scoring a duck-egg as Malvern Poker top-scored in round two with 28 points to give them 42 points in second spot as Ricky Buckland and Andrew Simmonds both notched wins. Other notable victories came from Anuerin Venables, Adam Smith, Sean Priest andGraham Gorton. Round Three was the new MTT round and this time Adam Smith was the only BCPC player to win a table as he clung on to clinch runner-up spot in the individulal standings with 25 points, seeing off Aneurin Venables in third on his table, with those 10 points good enough to give Nye top spot on 27 points as Tod Wood scored zero and slipped to 3rd. With all of the BCPC “A” players out, it was a nail-biting finish but once Karen Walton of Maidhands was eliminated in 4th place on her table, it was game over and the BCPC celebrated victory for the first time since 2015.